Maddy has not had an easy life. Abused by her mother as a child, abandoned by her as a young teen, then abandoned by the boy who impregnated her, Maddy found herself scorned by her fellow students, even after she miscarried the baby. Still, she dedicated herself to her studies and excelled in school while waitressing at the local cafe only to fall for another wrong guy who disappeared as soon as she told him she was pregnant. But Maddy is determined to make a good life for the baby she carries. She's saving her tips, determined to leave her small hometown and go to college to become a nurse. Then tragedy strikes. But, on the heels of tragedy, comes what seems to be a miraculous event. She finds an abandoned baby and Maddy does something wrong...for all the right reasons. With Cheryl, an older co-worker who has been like a mother to her, the three leave for the big city. Maddy earns a scholarship to study nursing, the baby thrives, and Maddy finally meets a man who treats her with kindness and respect. All of her dreams are coming true...until they aren't...and Maddy must face the actions of her past if there is to be any hope of happiness in her future. Maddy's Phoenix is a poignant tale that engaged my interest and my emotions. Though there is a romantic element - and happy ending - in this book, there is no doubt that it is Maddy's story. Delagrange takes her from her lowest point and patiently guides her through the evolution that follows, exploring a multitude of relationships. There's Maddy's relationship with baby Judith, her budding romance with Bryce, her familial relationship with Cheryl, Cheryl's own relationship with her estranged daughter, Maddy's fractured relationship with the mother who abused and abandoned her, and, finally, Maddy's relationship with herself. The treatment she was subjected to in her childhood and teens has had a deep impact on her psyche, robbing her of her self-esteem and leaving her feeling unworthy. At times, she seems impossibly young but, by the end of the book, her growth and internal strength is evident. I enjoyed Maddy's Phoenix and was in Maddy's corner the entire way. I also liked Bryce and the role he played in Maddy's evolution. I adored Cheryl, the woman who devoted herself to Maddy and Judith, even as she battled her own demons and guilt over her daughter's estrangement. I did, however, have a couple issues with the book that brought my rating down. The beginning of the relationship between Bryce and Maddy hit a hot button for me and though I found their HEA believable and satisfying, and turned the final page confident of their happy future, I still couldn't quite forget how their relationship began. Also, the resolution of Maddy's relationship with her mother seemed a bit too easy considering their history. Those issues notwithstanding, the characterizations are strong, the author's storytelling is engaging, and the ending, satisfying. I'll be reading this author again. In the Q&A below, Ms. Delagrange talks about her earliest memory. What's your earliest memory? What's your earliest book memory? Two people who leave a comment before 11:00 PM, August 18, 2017 will receive a digital copy of Maddy's Phoenix. Patricia Yager Delagrange grew up in the San Francisco Bay area, the daughter of a homemaker and fireman. The author of four women’s fiction novels, including the just-released MADDY’S PHOENIX, Patricia was among the first 400 women to attend what had been an all-male college. The mother of two (almost) grown children, she now writes full-time, except when she’s playing with her pups or riding her Friesian horse, Maximus. Patricia, did you always want to be an author? Patricia: I’m a latecomer to the author ranks. I had planned on becoming a psychiatrist. However, during a college internship at Napa Mental Hospital my sophomore year, I was cured of that interest while working with abused teens. I’ll never forget learning how one of my favorite patients had been put into a frying pan when she was a baby. I am an empath, and I became physically ill working with these poor young people. I couldn’t separate myself from their pain, couldn’t compartmentalize it enough to help them. Sometimes you’re just not made for things you think you want to do! This business of being an empath explains your ability to connect with your characters who have undergone the worst kinds of tragedies one could experience—the death of a baby at birth the death of a spouse and an adoption gone wrong. 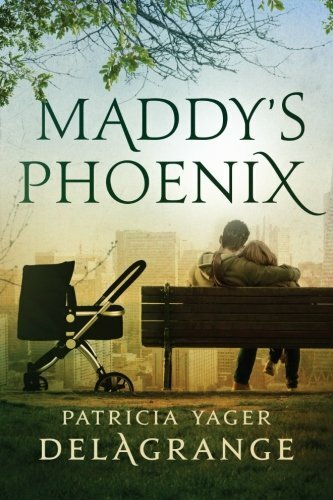 And in MADDY’S PHOENIX, a young woman who has had two miscarriages late term, then discovers an abandoned baby left to die in a dumpster. So you switched from psychiatry to—? Patricia: Spanish. I spent my junior year in Madrid, living in a Spanish dorm and taught by Spanish-speaking professors. I spent my senior year at U.C. Santa Barbara, where I graduated with a B.A. in Spanish. Ultimately, I earned my Master’s Degree in College Student Services Administration from Oregon State University and got a job as a Financial Aid Counselor at U.C. San Francisco. Which is why you able to write the character of college professor Bryce in MADDY’S PHOENIX so convincingly. Patricia: Well, I hope I did. I worked in academia. And MADDY’S PHOENIX is women’s fiction, but she does find romance in her life. After all, romance is a part of everyone’s life at one time or another! Were you always an avid reader? Patricia: My mom read to me when I was a child and enrolled me in the Book of the Month Club. I recall the first book I received—a story about the ocean and fish, with a blue-green picture on the front. I thought it was the coolest thing ever that I owned a book and would own a new book every single month. That’s when I started reading books. I never stopped. I don’t ever NOT have a book by my side. I go to bed every night reading a book, or I can’t sleep. In MADDY’S PHOENIX, Cheryl is an older woman who waitresses with Maddy at the little truck stop in Monte Rio, California. She’s much like a mentor to Maddy. Have you had an older woman, like Cheryl, who has mentored you? Patricia: My mother. I was very, very close to her. I adored her. She taught me what it is to be loved even when you’re not perfect. We’d talk on the phone all the time. Then I became her caretaker when she was going through chemo and radiation for ovarian cancer, a battle she fought for ten years. Even when she got Alzheimer’s, she never forgot who I was. She’d listen to all my stories, time after time, with as much enthusiasm as she had the first time. What’s something readers would be surprised to learn about you? Patricia: I am an elephant maniac. I even have a new tattoo on my right forearm of a mommy elephant with her baby that my daughter and I recently got at the same time. Patricia: I’m the third of six sisters. My sister who is 10 years younger than I am had a girlfriend who was getting married, and my sister invited me to the wedding—to set me up with a guy she knew would be there. Well, when I got there, I was drawn to the brother of the guy she wanted me to meet instead. After a couple of hours, I said to myself, “He’s the man I’m going to marry.” We’ve been together ever since. A couple of fun questions now. Earliest memory? Patricia: Sliding down the pole at the firehouse with my father. Patricia: A duckling. But when it grew into a full-fledged duck, we had to take it to a lake and set it free. Sad moment! Patricia: A baby blanket that was my mother’s. It hangs over the chair that was my mother-in-law’s when she rocked her five kids. Patricia: I just finished the draft of a story about four sisters and a family fractured by divorce until their mom dies after a long battle with cancer. I’m calling it MENDING FENCES. And how would you like readers to contact you? Patricia: My Facebook page is a good place—and I’d love for readers to sign up to receive my monthly newsletter so I can share fun stuff with them—like the latest news about my pups and my honey of a horse! They can do that on www.PatriciaYagerDelagrange.com. One of my first memories is my dad reading Bambi to me while I was in the hospital after having my tonsils out. I didn't have many books at home, but once I got old enough, I would walk to the library every Saturday morning and spend the day there. In high school, I spent any free time in the library and would even put myself on detention so I could spend more time there. Putting yourself on detention just so you could go to the library? Now, that's a love of reading! I remember loving libraries when I was a kid. There was something about the peacefulness that, even at a young age, drew me in and made me feel good. I was too afraid of getting in trouble at home if I got detention. In my Catholic high school upbringing we got detention for talking to boys! My being in detention wasn't a punishment. I just requested to stay and take the detention bus home. As the oldest of six, it afforded me some peace and quiet to do some home work and read. That was the main reason I first started going to the library on Saturdays - peace and quiet. I buried myself in the science and history sections and explored the world. At the same time, I discovered Nancy Drew and developed a love for mysteries. I guess most Catholic high school are the same. I transferred out after 7th grade because we moved out of town, but the nuns haven't changed much. My mother attended that school and she got into trouble for talking to boys, even her brothers. It just creates a forbidden fruit attraction. It seemed that most girls in the class I was in either became nuns or got pregnant right after graduation and getting out from under the control of the nuns. My earliest memory is that my dad tried giving me a nickle to go to the corner store for some candy. I told him I wanted a penny. For a penny you could get 3 or 4 pieces. He told me I could get more. So I asked him to come with me. I put the nickle up on the counter and the man gave me a bag. I kept putting candy in the bag, waiting for him to tell me to stop. I must have had 10 pieces of candy. As we walked home, I had candy in one hand and my Dad's hand in the other. Pamela, that is such a sweet memory of you and your dad. I remember sometimes (not often) being allowed to buy a candy bar at the local market. When in grammar school, that was when penny candy was all the rage for me. OMG, you're lucky the house didn't burn down. But what a hero that you got your sister out! My older sisters say they remember me sitting under the grand piano reading books all the time! My earliest memory is off my grandmother's illness and funeral. I was about three years old at the time. Hard to peg my first book memory. I was always reading. I would walk around reading. My mother was always afraid I'd trip down the stairs. Maddy's Pheonix sounds like a great read. I remember my grandma's funeral when I was 9 because I was in the hospital with pneumonia and they didn't want me to know until I actually got out of the hospital because I was so sick. I never got a chance to say goodbye to her or anything. Patricia, thanks so much for stopping by! Thank YOU for having me. I love seeing comments and having the opportunity to reply. Such fun! I remember sitting on my grandfather's lap in his wheelchair and him giving me a quarter. He died when I was 3, so this had to be before. OMG, Eileen. I don't remember anything before I was, like, five years old. What a great memory! One of my favorite early memories is putting books in my stroller at a grocery store. They were for my dad because I knew how much he loved to read. Nobody told me you had to pay for them until my parents found my hidden treasures!